Patient is a 45 yo homeless male that was struck by a car 3 months ago. He had left type 3A open prox tibia fx treated w/ a LISS and no problems in follow up. 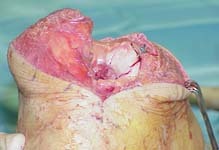 He also had a left medial femoral condyle fx that was impacted. The MFC had an ORIF and bone grafting, but has gone into varus w/ loss of the MFC reduction. He is now 3 months post injury w/ 15 degrees of varus and ROM of 20-120. Any suggestions? 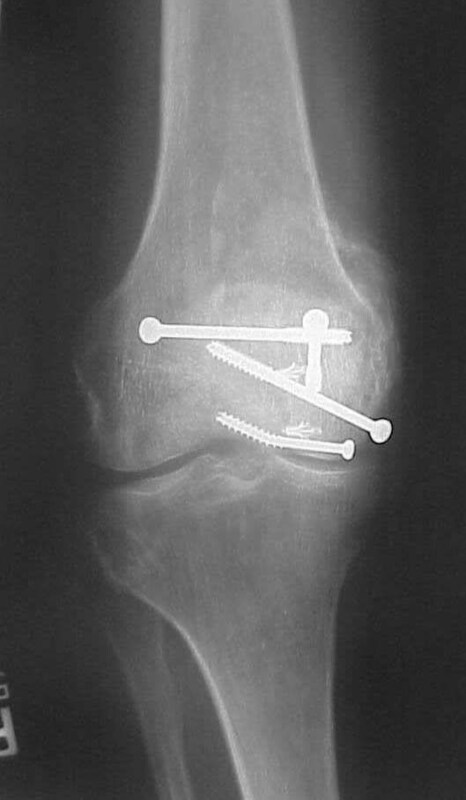 Osteotomy (femoral or tibial) vs revision ORIF? From: Marc F. Swiontkowski, M.D. Bill- I vote revision ORIF with ICBG- need longer anterior to posterior screws placed in lag manner. I believe the Hoffa component would remain un-united with a supracondylar osteotomy. I think if the wounds are well healed I'd try to fix that one again, and buttress my repair with a little plate in addition to the screws. what did you do with the distal femur fracture (medial condyle) that settled after ORIF? I opened his knee and removed the Hardware. The articular surface was smooth and healed. I felt that the entire Hoffa fragment must have settled w/ the distal femora articular surface and healed. A manipulation eliminated the flexion deformity, which I believe was due to posterior capsule contracture. I decided not to do a hemicondyle osteotomy and fixation. He is walking w/ a walker and going back to his tent tommorow. If his knee is a problem in several months, I will do an HTO. 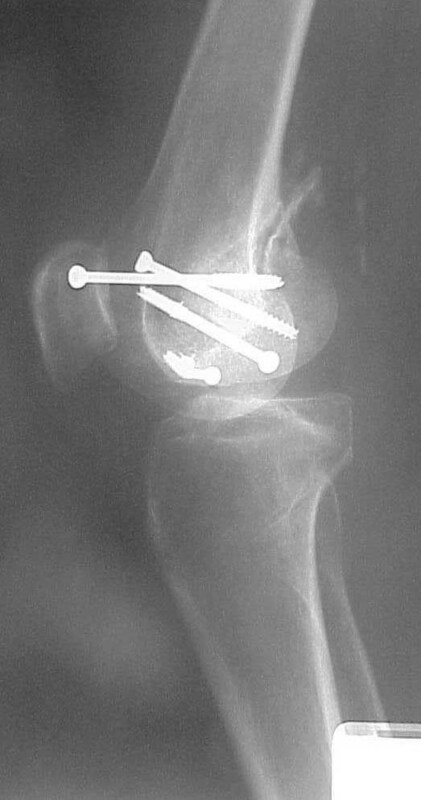 Doing a compensatory instead of a corrective osteotomy goes against my grain, but in this case I thought it was best. I do not know yet if I was Chicken or Wise.